FREE Women's Snowman Slipper Socks! You are here: Home / Great Deals / Christmas Deals / FREE Women’s Snowman Slipper Socks! FREE Women’s Snowman Slipper Socks! 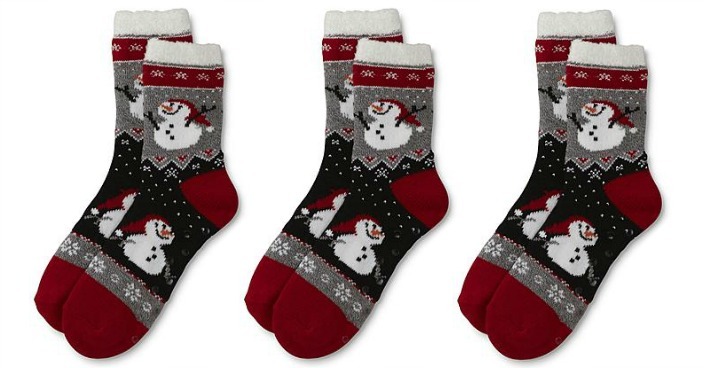 Sears has these Women’s Snowman Slipper Socks on sale for $4.99 (Reg. $12) and you can get back $5.04 in Shop Your Way points, making it FREE! Winter is your favorite season when you have these women’s slipper socks from Studio S. Lined with soft, silky plush fabric, these knit crew socks feel like a dream, keeping you cozy despite the chilly weather outside. Non-slip grippers on the soles offer extra safety as you pad around the house, while the snowman pattern lends a festive look.